RAY OF SUN, by Rock of Gibraltar. Winner at 1400m in Aust. Half-sister to SIR MOMENTS. Dam of two named foals, neither raced. SIR MOMENTS (Choisir). 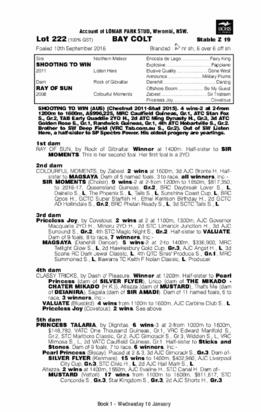 9 wins-2 at 2-from 1200m to 1650m, A$826,750, to 2016-17, Queensland Guineas, Gr.2, BRC Daybreak Lover S., L, Dalrello S., L, The Phoenix S., L, Tails S., L, Sunshine Coast Cup, L, BRC Qpos H., GCTC Super Starfish H., Ethel Kerrison Birthday H., 2d GCTC AD Hollindale S., Gr.2, BRC Phelan Ready S., L, Sky Thoroughbred Central H., Carbine Club Gold Coast S., 3d SCTC Tails S., L, BRC Padua College H.
Hamish Lad. Winner at 1350m in Aust. Ray of Sun. Winner. See above. Julie Magic. Placed in 2017-18 in Aust. Funloving. 4 wins to 1550m, A$93,125, to 2016-17, ATC Ranvet H., 3d ATC Schweppes H.
Kentucky Woman. 2 wins at 1100m, 1400m, BRC Aon Human Resources P., Darley Australia H., 2d BRC Gallopers Sports Club H., Gallopers $1 Membership H., 3d BRC Oztronics H.
Gaytime Girl. 2 wins at 1200m, 1400m in 2017-18, 2d ATC Jack Colville H.
Enjoyable. 4 wins at 1000m, 1100m to 2017-18 in Aust. Onetonnegun. 4 wins at 1200m, 1400m, AJC Zetland P., 2d AJC Glen Alpine 2YO H., 3d AJC Purple Patch H.
Colourful Moments. 2 wins. See above. Miss Swaney. Winner at 1200m, 2d STC Staffing Solutions H. Producer. Bottoms Up. Winner at 2, 3d STC Kinsela's Hotel 2YO H.
Priceless Heart. 4 wins from 1200m to 1800m in Aust. Xin Dong Tycoon. Winner at 1100m in Malaysia. Priceless Joy (Covetous). 2 wins. See above. SILVER FLYER (Kenmare). 15 wins to 1400m, A$402,960, AJC Liverpool City Cup, Gr.3, STC Civic H., L, 2d AJC Hall Mark S., L, 3d STC Frederick Clissold H., Gr.3. THE MIKADO - CHATER MIKADO (H.K.) (Danehill Dancer). 4 wins-1 at 2-at 1100m, 1200m, A$203,150, HK$2,079,750 in Aust. and HK, AJC Strada S., L, 2d AJC Skyline S., Gr.3. RISING RED (Redwood). 3 wins from 1600m to 2200m, NZ$174,000, A$212,852, to 2017-18, BRC Premier's Cup, Gr.3, 2d New Zealand Derby, Gr.1, MRC Naturalism S., Gr.3, 3d ATC Japan Racing Association P., Gr.3. MUSTARD (Vettori). 17 wins from 1100m to 1600m, A$811,617, STC Star Kingdom S., Gr.3, Concorde S., Gr.3, 2d AJC Shorts H., Gr.3, 3d MRC Caulfield Sprint H., Gr.2. SIR AMADI (Maizcay). 3 wins at 2, AJC Fernhill H., L, King Brian H.
MISHANI WARRIOR (Show a Heart). 10 wins from 1200m to 1600m, A$303,075, Qld Tatt's RC Tattersall's Members' Cup, L, BRC Thoroughbred Breeders H.
NAKAAYA (Tiger Hill). 5 wins from 1000m to 1600m, A$243,451, MVRC Sunline S., Gr.2, MRC East Malvern Community Bank Cup H., MVRC CFMEU Eight Hour Labour Day H., Legends After the Last H., 2d MRC Betfair H., 3d MRC Joe Brown H. Producer.